Creating a path to success in today’s reverse mortgage marketplace will be a major theme for the National Reverse Mortgage Lenders Association’s spring conference this year. NRMLA’s Western Regional Conference, taking place March 25-26 in Huntington Beach, Calif., features a programming schedule consisting of discussions around collateral risk assessments, marketing best practices and economic factors, as well as face time with a prominent new official from the Department of Housing and Urban Development (HUD). 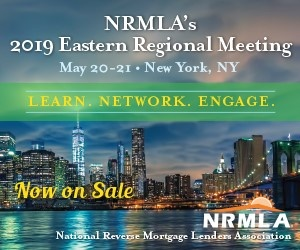 “The main objective of this regional meeting is helping loan officers succeed in today’s world,” said Steve Irwin, executive vice president of NRMLA in a phone interview with RMD. The conference will also introduce several reverse mortgage loan officers participating in a roundtable discussion that will allow them to share their experiences in today’s marketplace, and how their individualized approaches may help to facilitate further success given current business and product realities. Dr. Edward Seiler, VP of research and economic analysis at Dworbell, is on the agenda to present findings related to the debt and spending patterns of American seniors, which he feels will be important information for loan officers as it has pronounced potential to influence the decisions made by potential borrowers. Regulatory and compliance issues including state-specific topics will also be covered, as will servicing practices and regional trends. The conference will also allow attendees to see and have discussions with select personnel from HUD, including prominent new appointee Dr. Josh Miller, senior advisor to the deputy assistant secretary. Described as a “HECM resource” by Irwin and coming to the event from HUD headquarters in Washington, D.C., Dr. Miller will be introducing himself to the reverse mortgage industry at his dedicated panel. The collateral risk assessment and realities concerning second appraisals will be primary concerns. The NRMLA Western Regional Conference will be taking place early next week in Huntington Beach, Calif. RMD will also be in attendance, so feel free to send us an email if you’d like to meet up!